Clifford Cox Whitworth was born in Ossett in late 1897 the son of Horbury-born Arthur and Halifax-born Rosa (nee Cox). The couple married at St Matthew’s Church, Dewsbury West Town on the 24th December 1895. In 1901 Arthur Whitworth, a beamer in a woollen mill, his wife Rosa, 3 year old Clifford and 1 year old Lilly were all living on Horbury Road, Ossett, close to South Street. By 1911, the family were living at 5, South Terrace, Horbury Road with an additional son, Norman, born in 1905. Clifford was aged 13 and working for W.H. Smith & Son as a newsboy. The KOYLI 1st/4th Battalion was formed in August 1914 at Wakefield as part of the 3rd West Riding Brigade, West Riding Division. They moved on mobilisation to Doncaster and in November 1914 to Gainsborough, then again to to York in February 1915. On the 12th April 1915 they landed at Boulogne and on the 15th May 1915, the formation became 148th Brigade, 49th (West Riding) Division. Private Whitworth's service record has not survived. His MIC shows the British and Victory medals were awarded and that he had two service numbers in KOYLI 7825 & 203660. He ded not serve overseas before 31 December 1915 so did not qualify for the 1915 Star. Private Clifford Whitworth was gassed at Nieuport on the 21st July 1917 and died in hospital at Le Treport, aged 19 years, on the 24th July. On the 13th July, two KOYLI battalions marched from Annezin to Bethune station to entrain for Dunkerque, where they arrived in the course of the afternoon. They proceeded in barges to Zuydecoote (spending the night in the barges.) Next day, they marched to Bray Dunes, taking over some of the coast defences there. 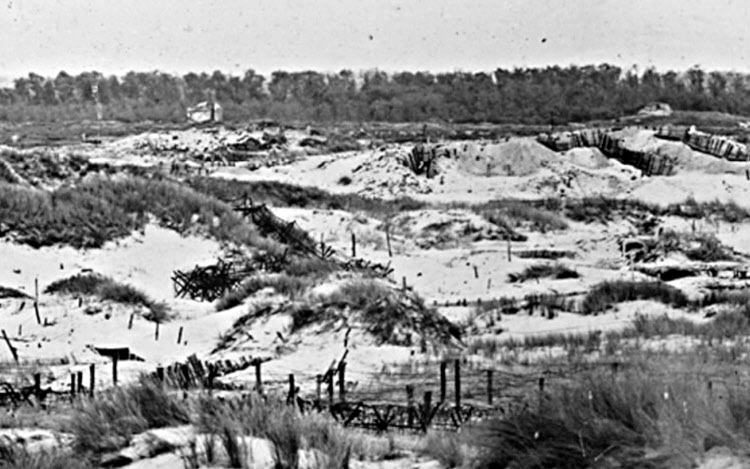 On the 18th July, a week after the 2nd Battalion had experienced their hard fighting there, both Territorial battalions (1/4 and 1/5) were in occupation of the Nieuport defences. The 1/5th Battalion were in front line with the 1/4th Battalion in support. The former had several casualties in its “A” and “C” Companies on the 18th July. On the 20th July, there was again a destructive bombardment. A day or two later, a heavy bombardment descended on the defences in the night of the 21/22nd July 1917. The enemy used shells of all calibres and included a large quantity of his new (mustard) gas shells. The 1st/4th Battalion of KOYLI, in support, were the chief sufferers. The gas attack was repeated twice. The gas smelt of garlic or mustard, and was the chief cause of an overwhelming number of casualties. The immediate effect was a slight irritation of the nose and throat. Sneezing ensued, followed by vomiting, and the eyes became acutely inflamed and very painful. Coughing and symptoms resembling bronchitis followed and prevailed for a week, at least, after contact with the gas. In the 4th Battalion, the casualties were 7 killed, 9 wounded, 423 gassed and 3 missing. Private Clifford Whitworth was one of those killed. In the 5th Battalion the total casualties for the period were 39 killed, 12 died of wounds, 3 missing, 153 wounded and 124 gassed. "Ossett Soldier Fatally Gassed - News came yesterday from an official source that Private Clifford Whitworth, of Horbury-road, Ossett, had died from gas poisoning. He was the son of Mr. Arthur Whitworth, and was not yet 20 years of age. The date of his death is stated as the 24th of July; and nothing had been heard to his fate until yesterday. Private Whitworth was in the K.O.Y.L.I. Before joining he was employed by Mr. Joe Burdekin, basket maker, and had been in the Boys' Brigade." Private Whitworth died on the 24th of July 1917 at the age of 19 years, a victim of a German gas attack. He is buried at grave reference II. E. 13. at the Mont Huon Military Cemetery, Le Treport, 2 Seine-Maritime, France. Le Treport is a small seaport 25 kilometres north-east of Dieppe. The Cemetery is 1.5 kilometres south of the town. During the First World War, Le Treport was an important hospital centre and by July 1916, the town contained three general hospitals (the 3rd, 16th and 2nd Canadian), No.3 Convalescent Depot and Lady Murray's B.R.C.S. Hospital. The 7th Canadian, 47th and 16th USA General Hospitals arrived later, but all of the hospitals had closed by March 1919. As the original military cemetery at Le Treport filled, it became necessary to use the new site at Mont Huon. There are now 2,128 Commonwealth burials of the First World War in the cemetery and seven from the Second World War. The cemetery also contains more than 200 German war graves.